Most videogames are built to let us do things we could never do in real life -- that is, they’re designed to make us feel like badasses. 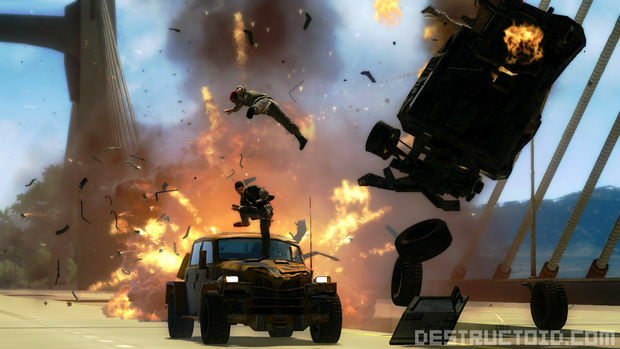 Just Cause 2 is that kind of videogame. The sequel to Swedish developer Avalanche Studios’ 2006 open-world action title, Just Cause 2 finds our hero, CIA black ops agent Rico Rodriguez, on the fictional tropical island of Panau in southeast Asia. He’s trying to overthrow Baby Panay, an evil dictator, but he’s got no official support from the CIA. But frankly, I was more attracted to the gameplay than the story in the ten-minute demo I saw yesterday. Hit the jump to read all about it. 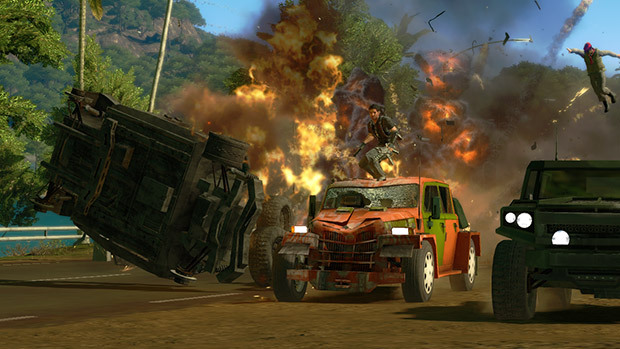 In Just Cause 2, you cause chaos in order to progress through the game. This is accomplished by doing just about anything -- missions, tasks, objectives -- and the developer called it the “currency of gameplay,” since creating chaos raises your influence, which opens up new strongholds that can be taken over. So let’s get into the chaos-causing situation I witnessed, shall we? Rodriguez was cruising through the air ten stories above the ground. He wasn’t flying, though; he was parasailing -- his grappling hook was latched on to the back of a jeep, and his parachute was open wide (the car was pulling him along). But suddenly, a man with a gun poked his head out of the car and took aim at Rico, so the soaring action hero reeled himself in by contracting the grappling hook cable, and in a second, he was perched atop the SUV. From there, Rodriguez took out one of the baddies firing at him from the side of the car, and then he quickly changed position to the back of the jeep, disposing of another enemy while hanging on for dear life. But he figured the driver just wasn’t worth the trouble, so he planted some C4 on the back of the truck. Since being that close to an explosion generally spells death, Rico attached a wire to the vehicle and then fired his grappling gun at a bridge’s steel beam while jumping off the doomed jeep back onto Blaine’s car. In an instant, the SUV was yanked off the road, at which point Rodriguez remotely detonated the plastic explosive. Pretty crazy, eh? Trust me: it’s much better to see it yourself. At one point, the demo man paused and showed the map of Panau. It was one of those “here’s where we’ve been playing, and [zooms out] here’s the entire game world.” Panau is massive; Just Cause 2 will feature over 260 settlements and 100 different vehicles covering land, sea, and air. I was also wowed by the visuals -- the game is running on version 2.0 of the Avalanche Engine, and the lush island vegetation is some of the most three-dimensional foliage I’ve ever seen. 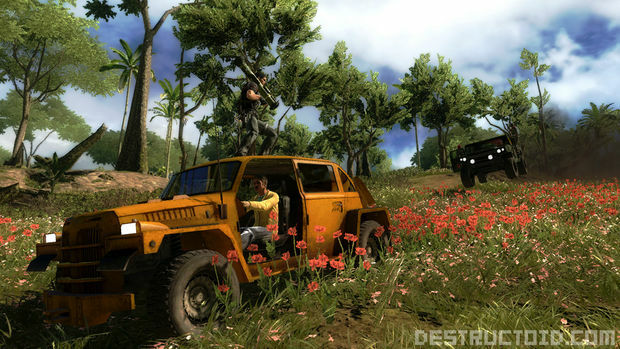 Definitely keep an eye on Just Cause 2.